For a third year in a row, ING Direct is running a 4-day (June 30th and July 3rd) promotion for its popular products to celebrate the coming Independence Day holiday. What are being offered in the latest promotion are ING Direct Electric Orange Checking Account, Orange Savings Account, Orange Mortgage, and ShareBuilder Investment Account. $76 referral bonus: Refer a friend during the promotion period and earn a $76 bonus for the first 2 friends who successfully open an Orange Savings Account with a minimum deposit of $250 using the link in the referral email during the month of July. The more you refer, the more you earn (the referral bonus is usually $10 for you and your friend still gets a $25 bonus). If you don’t have an account, you can always get $25 when using any of these ING Direct referral links. $17.76 Kids Savings Account bonus: Open a Kids Savings Account between June 30th – July 3rd and receive a $17.76 bonus into your new account. Only available when you open a new account with at least one new Customer (either you or the kiddo must be a new Customer to ING DIRECT and yes, the kiddo must be under 18 years old). $17.76 bonus starts earning interest upon account opening, and is available for withdrawal after 30 days. No minimum deposit amount required the KSA account (review). ShareBuilder Brokerage Account $76 bonus: Open an ShareBuilder Account with at least $3,500 and get a $76 bonus within 4 – 6 weeks after the deposit is made. Initial deposit must be made before August 31, 2012 to receive the bonus. Despite, there are other better discount brokers out there. $76 bonus for IRA Account: Open a Savings IRA with at least $1,000 and get $76 automatically credited in your account on July 12th. 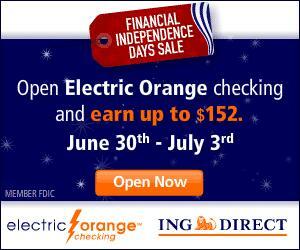 You can find more about this promotion at ingdirect.com/independence. I wish I had known that this promotion was coming. I opened my ING Direct savings and checking accounts just last week. I think fiscal conservatives would be more likely to support Libertarians, than social conservatives. Most of the Libertarian party platform on social issues, isn’t much different than Democrats. The main difference would be federal funding for them. There are many Republicans that are fiscal conservatives, but moderate or liberal on social issues. Just as a lot of social conservatives, are more moderate fiscally.